Graphics mode error - easy fix! Here is how to fix it! That's it! Some of the cutscenes might be slightly pixellated (more noticeable in the later levels) but it won't affect gameplay at all. Re: Graphics mode error - easy fix! what about the steam users? i cannot seem to find these? I'm not sure how Steam works, myself. I assume the files are stored on your computer somewhere? Do a search for the file winsetup.exe. Hopefully you can find it that way. nope, did a search came back with nothing. Hm. I'm afraid I don't know enough about Steam to know where they store the game files. They've got to be somewhere on the computer. Maybe try contacting Steam? Failing that, are there any Steam users here that know how this works? And if you can't find the files, no problem. Contact me privately and I'll hook you up with a copy of the game from my server. You should be able to access the file with no problem, then. With "Steam Installation folder" being, by default : C:\Program Files\Steam. Also, on a support note. I had a problem on my first launch : I had no sound. Running winsetup.exe and selecting, under "Digital Sound", "DirectSound (Hardware Mixer)" fixed the bug for me. I had this error and I have a fairly modern graphics card. Or to clarify, I got this error upon coming here and discovering that there was a settings program and after I had selected 4X AA, it set the resolution to 2560x1920 when my monitor has a max res of 1920x1200. Rather baffling! Had no idea I could change any of the settings until I came here either. Would be nice to be taken to the settings program after running it for the first time in Steam. I also noticed that in Steam, the default settings make the mouse lag quite a bit, and you might want to default it to running in a window rather than fullscreen. Other than that, I am enjoying the game! 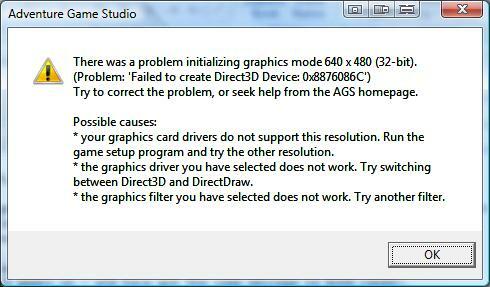 I had this error and I have a fairly modern graphics card. Or to clarify, I got this error upon coming here and discovering that there was a settings program and after I had selected 4X AA, it set the resolution to 2560x1920 when my monitor has a max res of 1920x1200. Rather baffling! I know this post is old and you're probably long gone, but this is pretty easy to explain. You didn't select 4x Anti Aliasing, you selected 4x scaling. There are no anti aliasing options for AGS games, only scaling options. There are some scaling options using the HQ filter which people sometimes mistakenly refer to as AA, but they're not. I think it might also be down to the type of monitor u have too. I have a really old lcd sony vaio (maximum is 1024x768) with an AMD 5450 card. I pretty sure it's the monitor that is causing this problem for me ,rather than my card ,which is old ,but not that old. Hello. I am encountering this error with two different games: Primordia and The Blackwell Legacy. I tried the fix you offered and it doesn't work with either of them. I've played Shardlight and Technobabylon, and they run just fine. These two won't even start. Please help? Could you take a screenshot of your winsetup file? On the left is my original setup file, on the right is the change to DirectDraw.